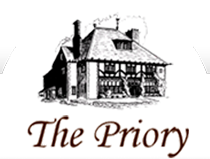 The Priory has developed over a decade of ownership by Judith & Mark Allworth. In many ways, The Priory is more of a hotel for the elderly than a care home and the individual touches of both the owners and the care manager can be seen throughout the house. We pride ourselves on creating a warm and welcoming atmosphere – a home from home and we are particularly proud of our home cooking using fresh, seasonal produce from local suppliers wherever possible as well as our own home-grown vegetables and salads from the garden. The Priory is a wonderful mix of listed building warmth with the light & bright of The Cloisters. There are many opportunities for socialising whether it be in the beautiful, sunny gardens in the spring & summer or the panelled drawing room on a winter’s day. You could also join the “ladies of the landing” in our fully glazed upper hallway or perhaps enjoy the activities that take place in our new lounge. This lounge is also used for parties or dining with families & friends. We are constantly on the lookout for new things to do. Typical of the activities we offer are musical afternoons, garden visits, pub lunches, coffee mornings as well as seasonal events including summer fetes, Christmas parties and trips to the seaside. Residents are welcome to bring along friends and family. We also encourage our residents to maintain and build links with the local community as well as their hobbies and interests.